March came and went before I was even able to flip to the next month in my planner. Seriously, where did those 31 days go? I know I was alive and breathing during the month of March, but somehow I can’t remember anything about it. Although we are already ten days into April (again: how? 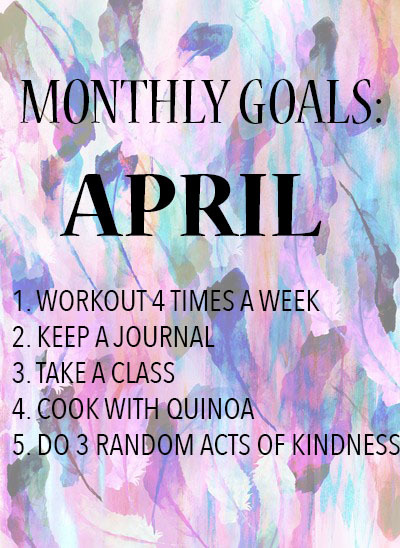 ), I want to share my goals for the month of April. One thing I learned throughout college is that goals should be realistic and attainable. So starting today, I’m going to work on accomplishing these five goals within the next 20 days. 1. Workout 4 times a week. When I work out, I tend to lack consistency. As I was training for the marathon, I would go to the gym and just run and then leave. My goal in terms of working out is to workout four times a week. If I’m just going for a run outside, it has to be at least 5 miles. Three of the four days must include strength training in some form. 2. Keep a food & workout journal. My sister got me a very cute journal with my initials on it for Christmas and I’ve been saving it for a special occasion. That’s a thing I do- I don’t use something because I want to save it for a better time, and years go by before I decide to use it. I’m going to use the journal to track my daily food and workouts. Maybe I’ll even do a weekly recap on here (no promises, though). 3. Take a class. I try and take fitness classes at my gym sometimes and I just tried out my a yoga class at a new studio near my home. I want to try something new and taking a class on anything, not even just a fitness-based class, but anything where I can learn something new. It would be great if I could find a Photoshop class, cause I’m struggling. I’ll keep you posted on this. 4. Cook something with quinoa. I spent a really long time pronouncing quinoa as KWIN-OH-UH. Just so we are on the same page here, it’s supposed to be pronounced as KEEN-WAH. Glad we got that out of the way. I’ve tried quinoa a few times in different salads and prepared meals, and I think it’s time I learn how to create a meal with quinoa. According to Forbes, quinoa’s super powers include: being a complete protein with all nine amino acids, having double the fiber of most grains, containing iron, lysine, and magnesium, riboflavin and magnese. If you got lost in all those fancy words, I’ll sum it up. Quinoa is the Beyonce of the grain family. #Flawless. 5. Do three random acts of kindness. One of my professors in college always made our homework to participate in a random act of kindness. I took this professor for about three different classes where she instructed this. Being flooded with papers, test, internships, and being blinded by the selfish desires us milennials tend to have, I normally forgot all about it until it was the day we were going to discuss it made something up. It’s time to make up for it. 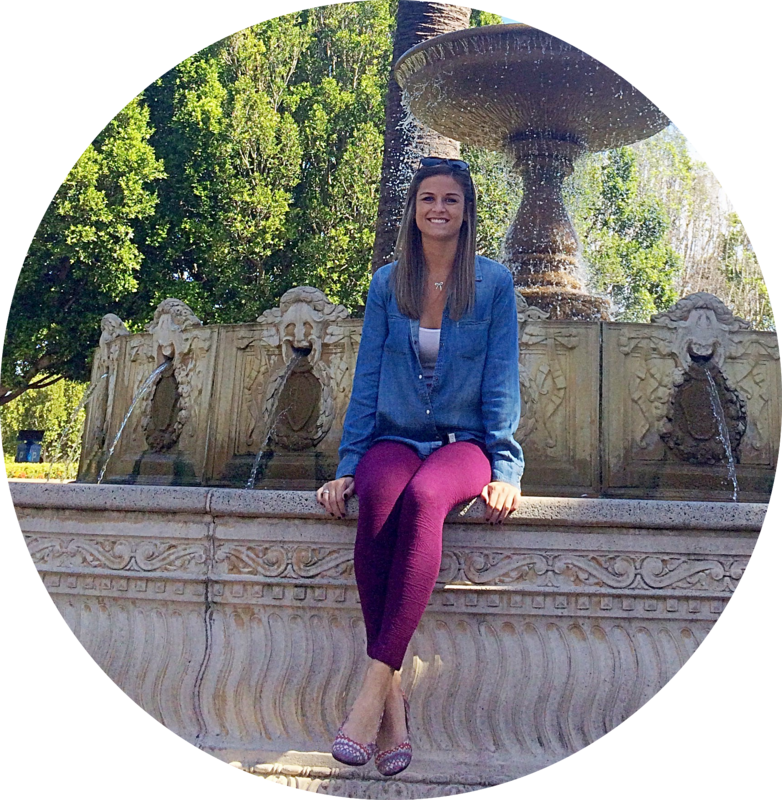 Three random acts of kindness in 20 days? Should be easy. …comment below any goals you have made for this month or any random acts of kindness you have done for others!